Questa settimana ho saputo da Domenico Bassi che Marella Agnelli è deceduta di recente. A partire dal 1994 ho iniziato da dare dei trattamenti privati di Ohashiatsu a Giovanni e Marella Agnelli. La maggior parte delle volte sono andato nella loro abitazione di Torino, con l’aiuto di Gianpiero Bellini, a qualche volta a Roma, accompagnato da Sigrid De Stefani, e spesso nella loro abitazione di New York. 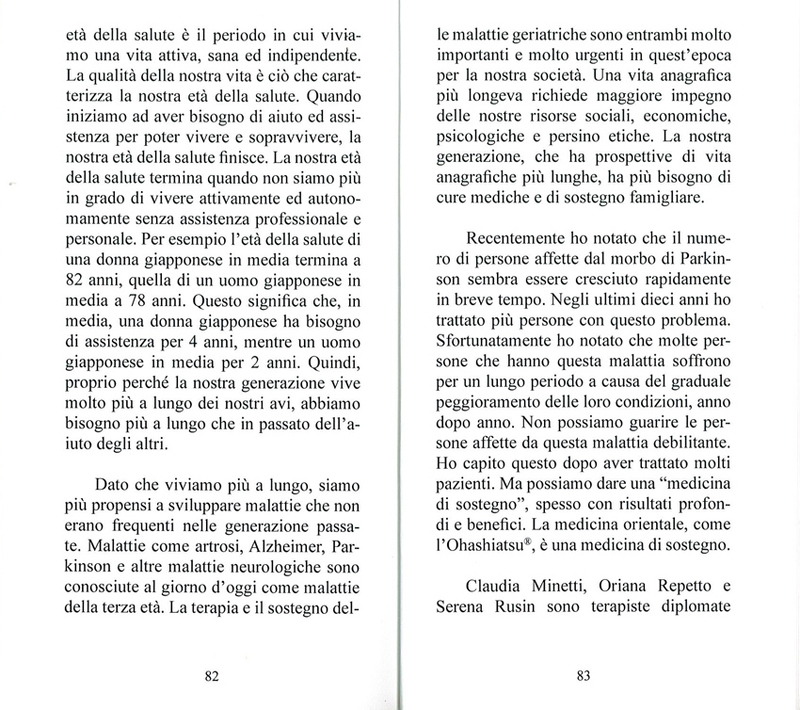 Queste due persone, specialmente Giovanni Agnelli, a cui ho dato trattamenti più spesso che a sua moglie, mi hanno colpito per la loro cordialità e genuina eleganza. Per me questa eleganza rappresenta il dono della civiltà italiana, e sono rimasto molto impressionato. Inoltre la famiglia Agnelli ha sostenuto il nostro Programma a Torino in diverse maniere. Per il nostro 10 anniversario, ci hanno concesso di utilizzare un bellissimo spazio per le conferenze, all’interno della FIAT. Devo molto a loro e sinceramente mi mancano. This week I learned from Domenico Bassi that Mrs. Marella Agnelli passed away recently. Starting in 1994 I began giving Ohashiatsu treatments to Mr. and Mrs. Giovanni Agnelli. Most of the time I went to their home in Torino with the help of Gianpiero Bellini, and a few times in Rome, accompanied by Sigrid de Stefanis, and quite often at their residence in New York City. These two people, and especially Mr. Agnelli, whom I treated more often than his wife, impressed me with their cordial and genuine elegance. To me this elegancy represents the gift of Italian civilization. I was always impressed. Also, the Agnellis supported our program in Torino in various ways. For our 10th anniversary celebration, they allowed us to use a lovely conference space owned by the Fiat corporation. I owe lots to them and I dearly miss them. We just received two beautifully designed and printed copies of Yashima — a journal dedicated to Japanese Culture and Martial Arts. Stéphane Crommelynck from Sakura Dojo conducted an interview with Ohashi at Dr. Karine Favresse’s home in Wavre, Belgium this past March, 2018. 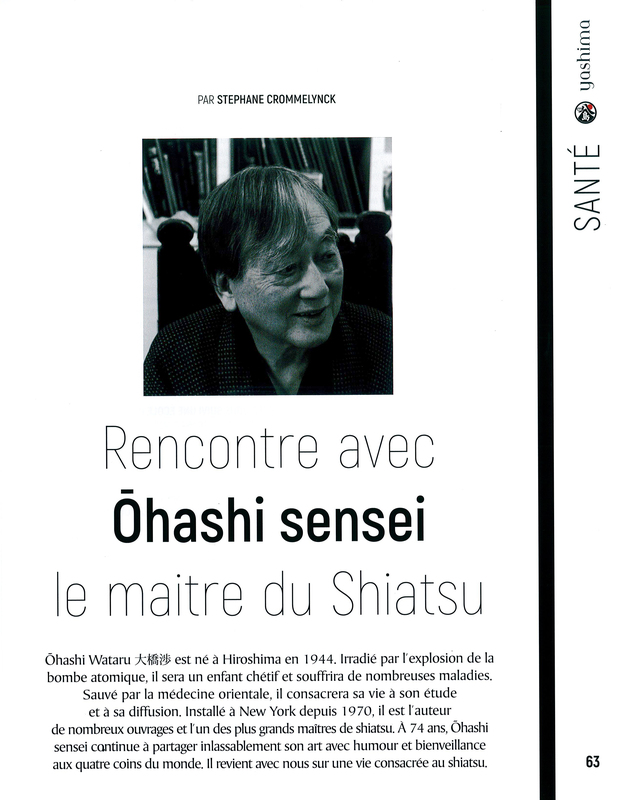 The interview, entitled Rencontre avec Ohashi sensei le maitre du Shiatsu, is published in this inaugural issue. Yashima refers to Japan’s eight main islands. This promising publication is a must for those interested in Japanese culture and arts. Find out more here. And check out the video about Yashima Magazine. In our Spring Newsletter we highlight the three interviews in Belgium. Ohashi was very honored to be interviewed about his life, experience and work. Upper left: Ohashi demonstrates using two separate points on Stéphane Crommelynck to create greater pressure without pain. Lower left: Ivan Bel with Ohashi. Right: Ludovine Dumontet with Ohashi. If you haven’t yet, check out the interviews conducted by Ludovine Dumontet, a student of shiatsu and author of her blog “Bien être par le shiatsu et le do in,” and Ivan Bel, a shiatsu teacher at Ryoho Shiatsu, who posts his interviews with many practitioners of Eastern healing arts. Read more at Yashima Magazine. On April 24, 2018, my son Kazuhiro and I left New York Shobo-ji on East 67th Street in New York in the early morning by school bus. We were on our way with some 40 other people to the funeral and memorial services for Kongō Sōken Mui Shitsu Eidō Tai Zenzu Dai Oshō, also known as Eidō Rōshi. Kongō Sōken Mui Shitsu Eidō Tai Zenzu Dai Oshō at the Ohashi Institute. 1997. As the bus was heading for Dai Bo Satsu Zendo in the Catskill Mountains, all of my wonderful experiences and encounters, my blessing and happy endless memories with Eidō Shimanō Rōshi came to me. Dai Bo Satsu Zendo in the Catskill Mountains. It was March 19, 1975 the day I met and was introduced to Eidō Rōshi. 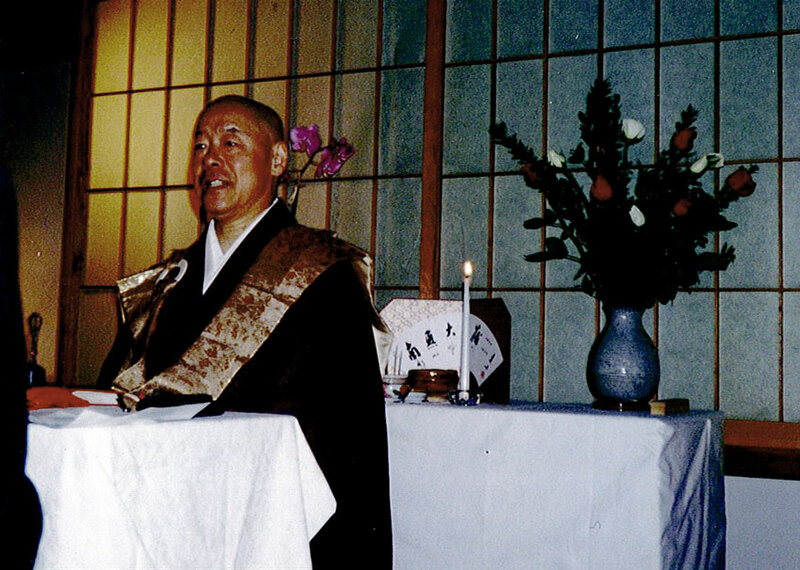 That day was the 68th birthday of Sōu-én Nakagawa Rōshi, who was a mentor to Eidō Rōshi. One of my shiatsu students, Harry McCormick, asked me to come and give an old Japanese man an Ohashiatsu treatment as a birthday gift. We went to Shobo-ji, a Zen temple in New York City. A younger monk came out and welcomed me saying “I’m Eidō Rōshi. Welcome Mr. Ohashi.” That was my first time to meet him. Then I gave a treatment to Sōu-én Rōshi, who didn’t utter any words, and I didn’t ask anything. Eidō Rōshi and Ohashi at Zendo. 1995. Ohashi gives an Ohashiatsu treatment to Edio Roshi by the lake at Zendo. 1979. Immediately, I followed Eidō Rōshi’s advice. That evening I started teaching without any students, without knowing anything I’m teaching, without any plans, without any place to teach. Eventually, I achieved my school with many branches in the U.S. and Europe. On January 2, 1977 Bonnie and I married at Shobo-ji. Eidō Rōshi officiated and conducted a beautiful ceremony for us and our friends, who chanted with us to encourage our union. Ohashi and Bonnie on their wedding day. 1977. Later, I asked Eidō Rōshi to allow me to start a summer program for our students at Dai Bo Satsu Zendo, which had been built a few years before. He accepted our request. Our first Ohashi Institute Program at Zendo started in July 1979, and continued every year for more than 20 years. From practically all over the world, from many different nationalities and from all corners of life, people came to attend. This 10-day program was a profound and meaningful experience for the all the people who participated. Former students still thank me for putting them in touch with Zen Buddhist philosophy, and specifically the temple in New York City and in the Catskills. Dai Bosatsu Zendo in the Catskills Mountains. I believe more than 1000 people came to Zendo through our program over the years. Eidō Rōshi gave us speeches about Zen, and all the Zendo residents helped our program run smoothly. Without this summer program, I don’t think the Ohashi Institute would have prospered as much as it did. A large group at Zendo in the Catskills. Students in the Advanced, Intermediate and Beginning courses. 1996. Morning tea ceremony with Ohasi and Eidō Rōshi. 1995. All the memories of Eidō Rōshi and our experience of Zendo came back to me when I attended the ceremony. My deepest gratitude will continue to go to Eidō Rōshi forever. Ohashi always gets many requests for his time. Whether it’s to teach or for treatments, tutorials, speeches, or simply to ask him about his life and philosophy — Ohashi is always receiving requests. Two requests that I’d like to write about here came a couple of years ago and recently have produced positive results. One of the many requests Ohashi receives is to write Forewords for books. Ohashi is well aware of the effort that goes into being published. 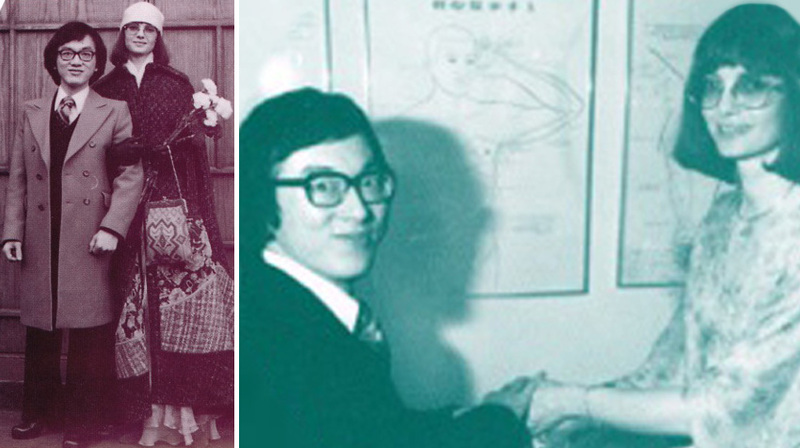 Starting at a young age, his first book Do-it-Yourself Shiatsu was published in 1975, preceded by at least two years of writing. Soon after that came Healthy Pregnancy and Touch for Love (with editing and translating Zen Shiatsu in between). He admires those who go through the process of writing their own book. Usually, requests for writing Prefaces, Forewords and Afterwords are from his former students or those that have worked with him professionally. One such request came from our long-time friend Tara Thompson Lewis. Tara, who has been a fellow student, is an amazing therapist. She specializes in vocal massage, a very specific technique that requires not only her professional touch, but also the absolute trust of her clients. Tara’s personal story intertwines closely with the Ohashi family’s. In fact, her parents were students of Ohashi’s back in the early 1980s, when Ohashi and Bonnie were first starting out in New York City. As the story goes… well maybe, I should let you discover the story yourself. If you want to know the connection between our two families, pick up a copy of Tara’s book and read Ohashi’s Foreword. Two years ago, Tara, emailed Ohashi asking for him to write the Foreword to her book. This book, is a continuation and expansion of the research and work that her late mother had started years ago. Tara meticulously organized her mother’s notes, typed up the manuscript and found a publisher. She was completing her mother’s work. Of course Ohashi was happy to oblige her request. He had known Tara’s mother; she had been in his classes. Around the same time, we also received a request for a personal meeting from a gentleman named Norio Tomita. Tomita, originally from Japan, now lives in Montreal, Canada. He has a Master’s degree in Mechanical Engineering from Keio University. Tomita has developed 3D imaging technology and has collaborated with several doctors. 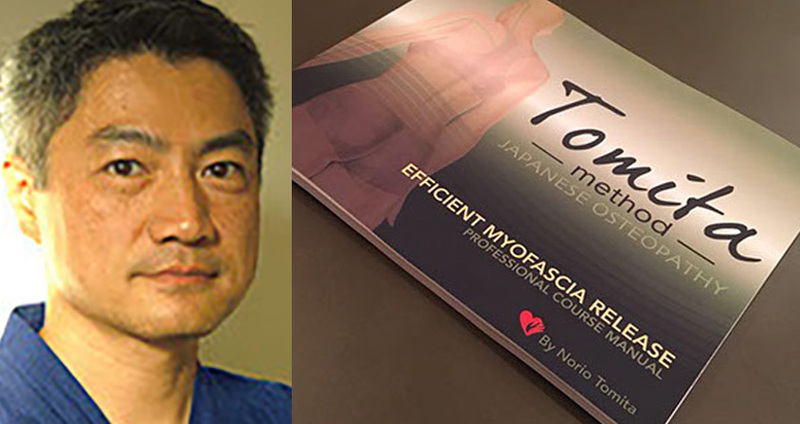 Now, Tomita is developing his own technique based on Seitai, Japanese hand techniques and massage therapy. He called us at home in Kinderhook and asked to come and spend the day with Ohashi. He would be coming from New York and would return the same day. Ohashi had never met Tomita before, but he was happy to invite him to our house. Tomita visited and spent the afternoon with Ohashi. He was able to ask Ohashi for his personal advice — professional and life experience. It was a productive and friendly meeting; Tomita showed great respect and appreciation. He understood that Ohashi was giving him valuable advice from his own experience. At the time, Tomita was in the process of writing his own book. Congratulations Tomita on your new book! This past December 2017, at Ohashi’s annual Practical course at the Integral Yoga Institute, we were delighted to see both Tara and Tomita again. Tara, who lives in NYC, came to assist in Ohashi’s course. And Tomita-san traveled from Montreal to take Ohashi’s four-day Ohashi Method practical course. And since their initial requests, both have published their books! We, the Ohashi family, would like to congratulate these dedicated, smart and bright individuals on their success. 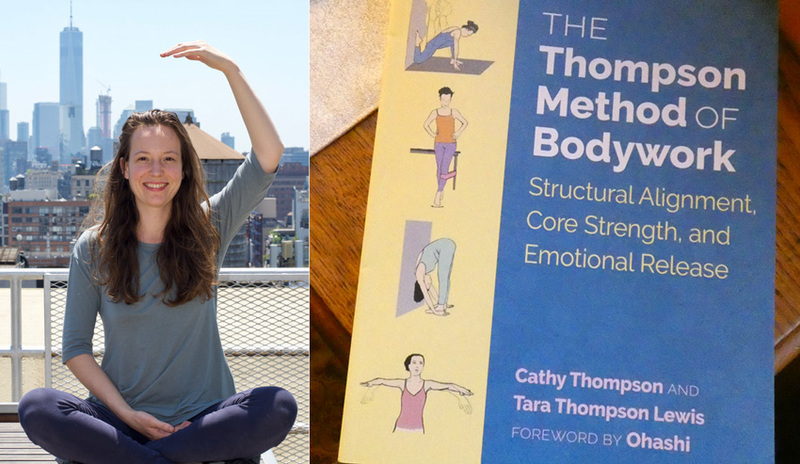 Tara’s book, “The Thompson Method of Bodywork” expands on her mother’s writings to explore topics such as structural alignment, core strength and emotional release. 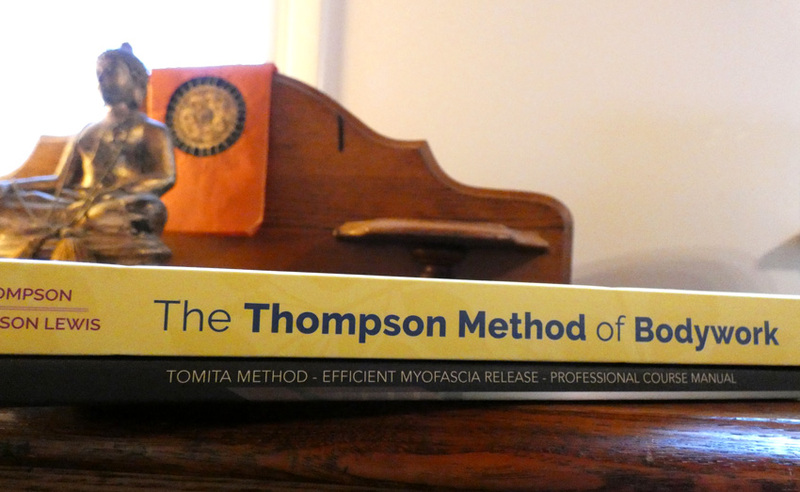 Tomita’s book, “Tomita Method : Japanese Osteopaphy” is a clearly illustrated manual. It draws from his medical understanding of the human body and applies his knowledge of myofascial connections to mitigate pain and tension. Ohashi admires both of these published authors. They have a deep understanding of the subject matter, which is only enhanced by the act of writing about it. Perhaps most importantly, he’d like to call special attention to the titles. Both put their names in the title of their own methods. They ‘branded’ and attached their names to the method or modality that they are writing about. This is what Ohashi has been advocating for 45 years. The registered brand names “Ohashiatsu” and “OHASHI Method” are not some marketing gimmick; it’s a way to take full responsibility for what we are advocating, what Ohashi has been teaching, what we believe in. There are overlaps between modalities and methods, but within the overlaps there is space to develop your own ideas, your own methods from multiple sources. Study everything and make your own conclusions. Most importantly, use your name while explaining and using your method. Without this direct responsibility, without putting your own stamp on what you practice, you will not achieve full success in the the long run. Trends are exactly that, trends. Eventually they will fall out of favor for something else. Trends use generic names. That means anyone, a good or a bad practitioner, can use that name. Anyone can define it and manipulate it. But only you can use your own chosen trade name. Only you can control the core and philosophy that forms your own method. It is solely yours and yours to protect and define. Ohashi was very happy to see both Tara and Tomita understand this. They understand the long term benefits of attaching their own name to their methods, to make it stand out as their own. What’s in a name? Everything. Ohashi returns to Acqui Terme, Italy November 22, 2017 to offer a workshop and sessions for treating Parkinson’s disease, sponsored by Sastoon Pietra Di Luce. For more information, please download the English and Italian versions of the brochure. In the meantime, we want to share with you a preface he wrote last year. 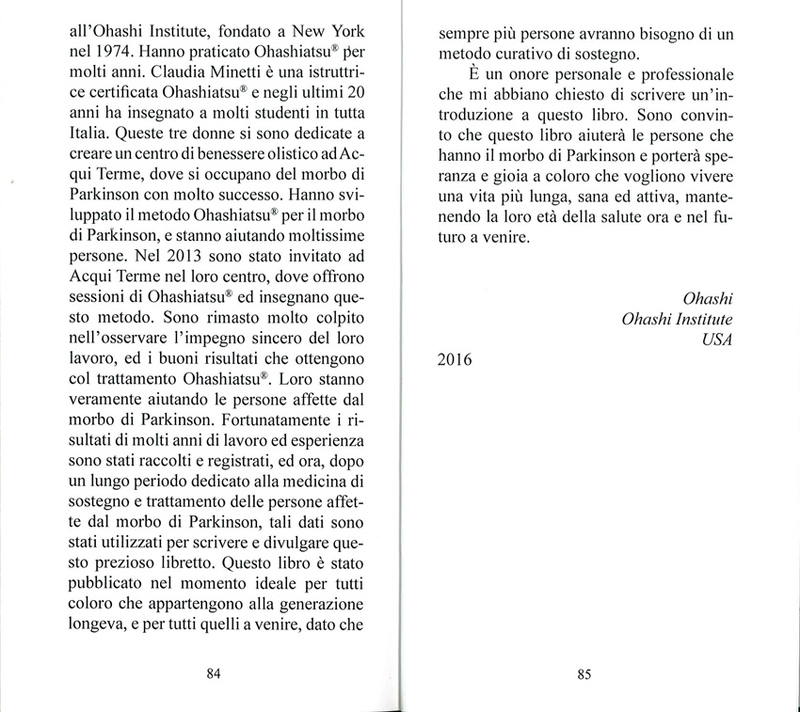 The book is a group of stories of people with Parkinson’s disease who were treated by Ohashiatsu Instructor Claudia Minetti and her colleagues at their clinic in Acqui Terme. 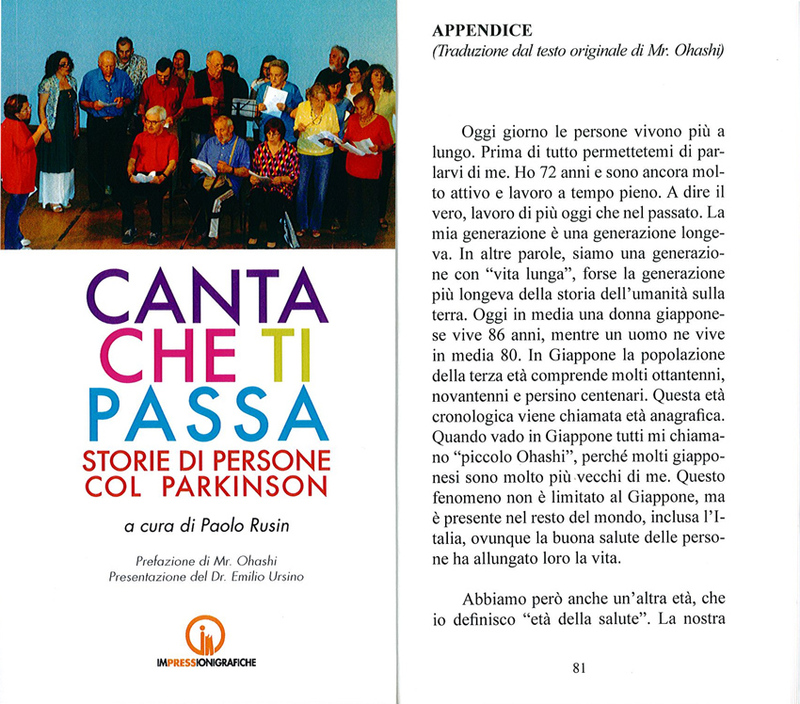 Both Italian and English versions of the preface to Canta Che Ti Passa: Storie di Persone col Parkinson are below. People nowadays live longer. Allow me to talk first about myself. I am 72 years old this year, and I am still healthy, active and working full time. Actually, I am working more than ever before. My generation is a generation of long life. In other words, we are a “longer life” generation, perhaps the longest-lived generation in the history of human life on earth. Today, an average Japanese woman lives 86 years, while an average Japanese man lives 80 years. In Japan, we have an aging population with many 80, 90 and even 100 year-old people. This chronological age we call “life age.” When I go back to Japan, everyone calls me “baby Ohashi” because so many Japanese people are much older than me. This phenomenon is not limited to Japan, but is occurring elsewhere in the world including Italy, wherever peoples’ improved health have extended their life age. We also have another “age” which I call “health age.” Our health age is the age in which we are living our active, independent, and healthy lives. Our quality of life is central to our health age. When we begin to need a caregiver’s help and assistance in order to live and survive, our health age begins to end. Our health age fades when we are no longer able to live actively and independently without professional or personal care assistance. For example, a Japanese woman’s average health age ends at 82, while a Japanese man’s average health age ends at 78. This means the average Japanese woman needs and depends on her caregiver’s help for 4 years, while the average Japanese man may require 2 years of assistance. Even as our generation lives much longer than our ancestors, we are reliant more than ever and longer than ever on the care of others. As we live longer, we are also more prone to develop the types of health problems which were not as prevalent in our ancestors’ generations. Diseases such as arthritis, Alzheimer’s disease, Parkinson’s disease, and other neurological disorders have now become known as problems of aging or gerontological diseases. The treatment and care of gerontological issues and problems are both very important and very urgent at this time for our societies. Because we are living longer in our life age there are growing demands on our social, economic, psychological, and even ethical resources. Our aging generation is needing more medical attention and family care. Recently, I noticed that Parkinson’s disease seems to have rapidly increased over a short period of time. Over the last 10 years, I have treated more people with this problem. Unfortunately, I have witnessed many people with this disease suffer for a long time, as gradually their condition worsens year by year. We can not cure people of this debilitating disease—I found this to be the case after I treated so many patients—but we can give “care medicine” for them, often with profound and beneficial results. Oriental medicine such as Ohashiatsu is care medicine. Claudia Minetti, Oriana Repetto and Serena Rusin are graduates of the Ohashi Institute, established in New York City in 1974. They have been practicing Ohashiatsu® for many years. Ms. Claudia Minetti is a Certified Ohashiatsu Instructor®, and for the last 30 years, has taught many, many students all over Italy. These dedicated women have established a clinic in Acqui Terme, where they are treating Parkinson’s disease with great success. 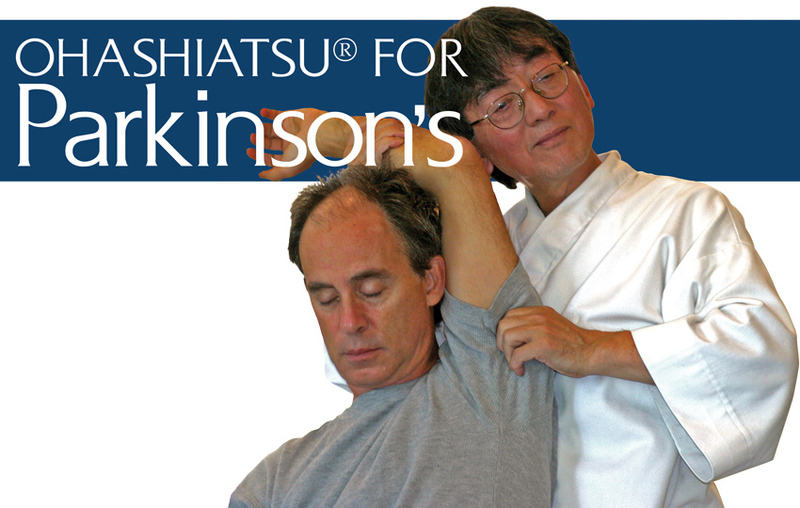 They have developed Ohashiatsu for Parkinson’s disease and are helping so many people. In 2013, I was invited to Acqui Terme to their clinic where they are giving treatments of Ohashiatsu and teaching this method. I was very impressed and moved to witness their sincere dedication to their work and the good results they have with Ohashiatsu treatments. They are truly helping people with Parkinson’s disease. Fortunately, they have kept all of the records from years of their work and experience. And now, after many years of giving care medicine and treating people with Parkinson’s disease, they have written and developed this very important booklet. This booklet is published at the best time for all of us in our long-lived generation and for those to come, as more and more people need this healing method of care. It is my personal and professional honor to be asked to write the introduction of this booklet. I believe this book will help people who are suffering from Parkinson’s disease, and will give hope and bring joy to those who want to live longer, healthier and more active lives extending their health age now and in the future to come. Two years ago I had the great honor to meet a very dedicated, earnest and serious student of Ohashiatsu. That is to say this student wasn’t overly rigid or strict with herself, just that she was focused and eager with regards to her studies. I first met Kelly Kempter in December of 2015 at Ohashi’s yearly 4-day practical course at Integral Yoga Institute. The thing I remember most about Kelly from that class was that she was very organized. She had emailed me previously from Ann Arbor, Michigan where she had studied Ohashiatsu with one of our former COIs. Kelly also has a very successful practice in Ann Arbor; Kaizen Healing Arts. Kelly was very happy to be coming to NYC to study directly with Ohashi. Besides taking the practical course, she also wanted to take Ohashi’s one-on-one tutorial and receive a session from him as well. She emailed me before leaving Michigan to guarantee her reservation for these additional activities. She asked important questions about how to prepare for her travels to the East Coast. Ohashi appreciates this type of careful preparation. In his viewpoint, a student isn’t just paying for a course, they are also spending their time for Ohashi. Furthermore, they are not only spending money for his class, they are also spending it to travel, to stay away from home, to eat and all the other expenses that come with traveling. Ohashi is thinking about this when a student comes from far away. For him, it’s that dedication that he appreciates and that he wants to honor, — by greeting them when they arrive and giving his best teaching. Finally, Ohashi is a big fan of maximizing one’s time. Kelly did just that. If Kelly was going to travel all the way from Michigan, dedicate four days to staying in NYC and learning directly from Ohashi, then she was going to get the most out of it. That is why it was important to her to take the tutorial (which she stayed an extra day for) and receive a session from Ohashi. She understood that this opportunity, the experience, was at the right time. She took full advantage of her trip. Kelly (far left) completes Ohashi’s special tutorial. For me, most impressively, Kelly was one of the first students to arrive at class each morning. And she was, of course, on time to her tutorial. (Also, her gi was perfectly neat and to the specification of the Ohashiatsu guidelines.) This was her dedication showing through. When you are early and ready the class is already a success, the session is already a success, the day is already successful. Kelly knew these things and Ohashi was happy to witness this. A great group of students from Ohashi’s 2016 IYI practical course. Well, I’m happy to report that I was able to meet Kelly again recently. Last month, after many email exchanges, Kelly was able to come to our office and home in the forest in Kinderhook, NY for her final graduation exam with Ohashi. Because Ohashi’s schedule is so busy this year it was a bit of a challenge to organize a time for her visit, but we figured it out. Kelly drove from Michigan with her husband Scott (after attending a rally in D.C!). It was a lovely visit and Kelly was able to meet Bonnie, my mother. The five of us spent some quality time together before and after the exam. Well, of course Kelly passed her exam and was happy to receive feedback on her technique from Ohashi. The Ohashiatsu family of graduates and Certified Instructors extend congratulations and admiration to Kelly for her dedication to Ohashiatsu and to her own personal development. Kelly finishes her final exam with Ohashi. Kelly already has established a successful healing arts practice and we know that her continued investment in education and experience will serve her well. You can visit Kelly for a treatment and follow her on social media. Two weeks ago Ohashi and I had a great ski trip in Vermont. On this trip we were able to reconnect with our good friend Jesse Labow who we met in December last year at Ohashi’s 4-day practical course held at Integral Yoga Institute in New York City. Jesse came all the way down from Vermont to practice Ohashiatsu® / OHASHI Method® with our dedicated COIs, all the wonderful students, and of course, with Ohashi himself. Before the course started Jesse took a private tutorial with Ohashi. From that tutorial and throughout the course, I could see Jesse was not just simply giving bodywork, he was enjoying the act of giving. In a phrase, he was “feeling it” — the connection where you are not doing, you are not working, you are simply being. You are enjoying the act of giving, the state of being. Jesse practices his neck technique at Integral Yoga this past December. Our smiling COI Marco Beghin observes. I was happy to meet and talk with Jesse during the course in NYC. Right after the New Year Jesse emailed Ohashi asking if he would come to Rutland to teach him more OHASHI Method techniques. I think this was more than Jesse expected to take on, but he agreed, eager for the opportunity to work with Ohashi again and to take a new step in his professional career. A little more than a month later, Ohashi and I were up in Rutland and we couldn’t have been more pleased with the job Jesse did registering students, finding a place to hold the course, and all the other small details he thought of that made a big difference in the success of the course. When we arrived we stayed at Harvest Moon Bed & Breakfast. This traditional and beautiful B&B, run by Jesse’s mom Susan, was the perfect accommodation for us. Later that day we visited the course site. Jesse’s friend, Dimitri, in his great generosity agreed to host the course at his residence — a beautiful house in Rutland full of light. After talking and discussing the next day’s workshop, Ohashi and I had dinner with Jesse and his wife, Hahn, at their residence. Someone at the class asked if my Scarf Technique is good for people who have suffered a stroke. My answer is yes – but you must give very gently, and only if they agree. It is an effective way for loosening up muscle tightness. Thank you to Lisa Marie Donohue, MA, LMT at Thrive Center of the Green Mountains for this question. Thank you to Dimitri for this beautiful class room space. Jesse and his wife prepared not only a great healthy breakfast for the students, but also an exquisite meal of Japanese rice balls (Onigiri), miso soup, and other delicious vegetarian dishes. 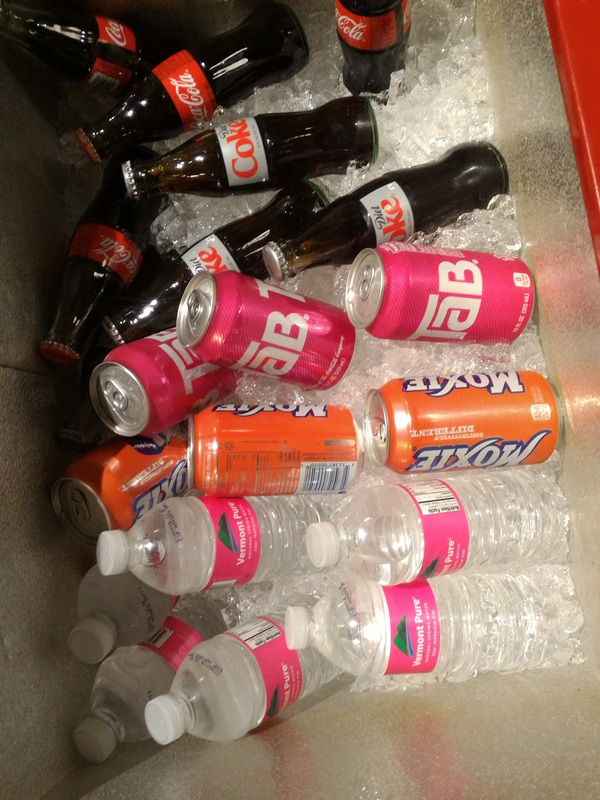 All free of charge! By the way Jesse and Hahn run a catering business — Good Karma Kitchen. Please check them out if you are in Rutland. 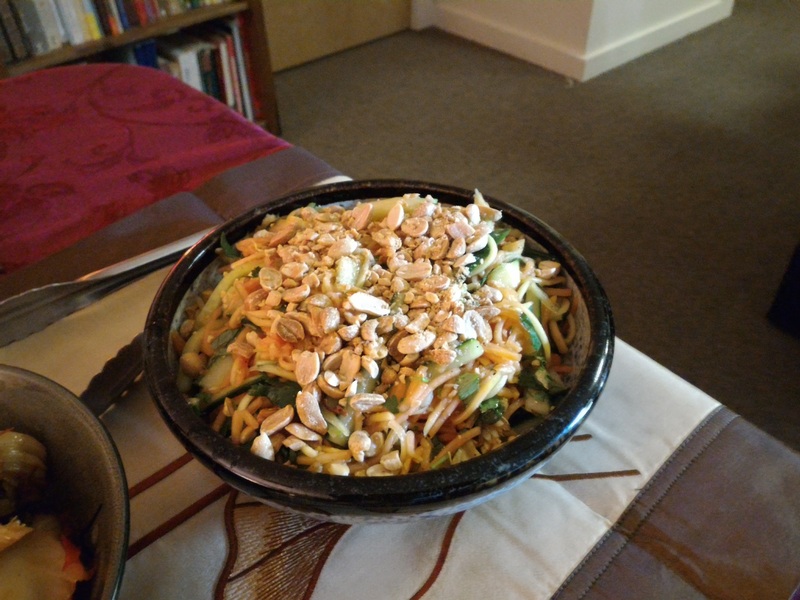 Good Karma Kitchen provided good eats at Healing Scarf Technique workshop. More deliciousness. Thank you Dimitri for the sweets. Everyone was well fed and happy to have Hanh prepare a special meal for them. They were ready for more of Ohashi’s special scarf technique the rest of the afternoon. After the course Ohashi gave six sessions in Dimitri’s treatment room. And we finalized our night with a visit to a local Chinese restaurant suggested by Hahn. Our special guest inspects the massage tables. Great job! Congratulations to all the professional therapists who attended Healing Scarf Technique workshop in Rutland, Vermont. Thank you to Marjorie Pivar and Sarah West at Shiatsu School of Vermont for the happy horse. Next day 28th of February Tuesday, Jesse, the young man who arranged this trip, took me to Killington Mountain and paid for everything. Jesse is really a great ski instructor who taught me lots. That was my best skiing experience in the last 20 years. On the slopes. Epic selfie by Jesse. Frozen falls on the slopes. After packing up our gear we met with our long time friend and COI Diedre Seeley for a late lunch at a Japanese restaurant. She lives in Killington Village and has a successful massage practice there, Mountain Dove Wellness. It was great to catch up with her and to be in her energetic presence. By the way “Happy Birthday Deedee… belated. Diedre is always available for Ohashiatsu® Sessions via email and at New Life Hiking Spa starting May 15, 2017. That evening Hahn prepared an “official” dinner for us. It was really a special evening with our friends. This time Susan joined. Hahn really outdid herself with this feast. 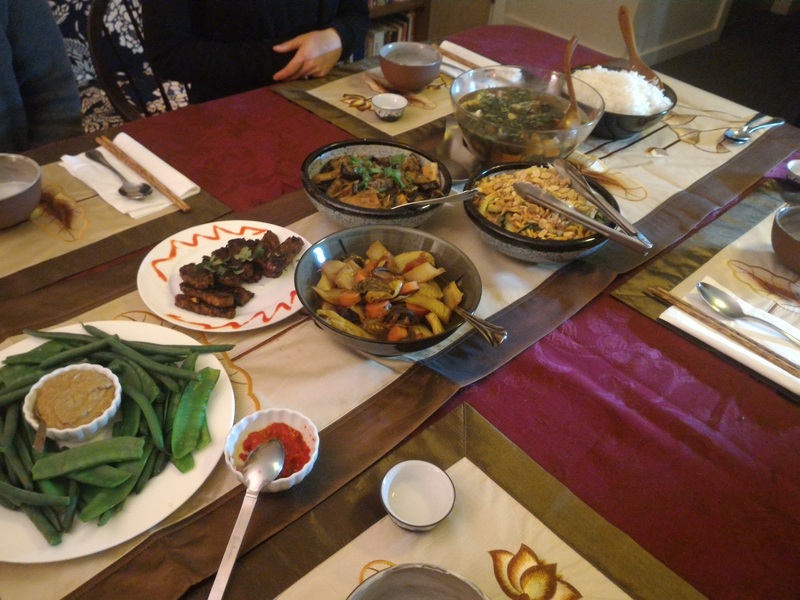 We were treated to a plethora of traditional Vietnamese dishes, all vegetarian, all delicious. I personally enjoyed the fried tofu with chili paste. Ohashi loved the saki selection and I think we all enjoyed the the apple cobbler with ice cream that Susan brought. Vegetarian Vietnamese dinner at Jesse and Hahn’s place. The next day it was time to leave Rutland. Ohashi visited the maple syrup distiller next to the B&B. I packed and we said our goodbyes to Rutland. For the rest of the day Ohashi, Jesse, Hahn and I wondered the aisles of the famous Vermont Country Store, sampling to our hearts content. Ohashi and Jesse pose outside The Vermont Country Store. Ohashi and Hanh check the foggy hillside. Yes, Tab at The Vermont Country Store! One last photo before we go. Life is always a big surprise. Life is always full of strange luck. I didn’t plan or expect anything, yet everything worked out beautifully. This is great luck! In Japanese the word for luck is ‘un’. The Chinese character means you are bringing yourself to where the luck is. So let’s prepare for the Luck which may happen in front of you. Is there anyone who wants me to come to give tutorial? If so, I’m well prepared! “Un” in Japanese means Luck. In this Chinese character the man brings his cart to where the luck is. Finally it was time to say goodbye to our hosts. We couldn’t have asked for a better ski vacation. And we look forward to visiting Jesse, Hahn, Susan, DeeDee and the rest of our friends up north again.